BMW is an acronym for Bayerische Motoren Werke AG — or, in English, Bavarian Motor Works. Whatever you call it, the German-based company is one of the world's most respected automakers, renowned for crafting luxury cars and SUVs that offer superior levels of driving enjoyment. Founded in Munich, the company began in the early 1910s as an aircraft manufacturer. BMW's current logo, designed to represent white propeller blades against a blue sky, reflects these origins; its blue-and-white color scheme also references Bavaria's blue-and-white checkered flag. 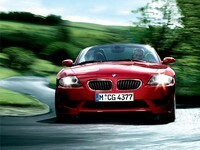 1 Series is a 2-door, 4-passenger luxury sports coupe, or luxury convertible. 3 Series Sedan is a 4-door, 5-passenger luxury sports sedan. 5 Series is a 4-door, 5-passenger luxury sedan, or luxury sports sedan. 6 Series is a 2-door, 4-passenger luxury sports car, or convertible sports car. 7 Series is a 4-door, 5-passenger luxury sedan. X3 is a 4-door, 5-passenger luxury sport-utility. X5 is a 4-door, up to 7-passenger luxury sport-utility. 6 is a 4-door, up to 5-passenger luxury sport-utility.